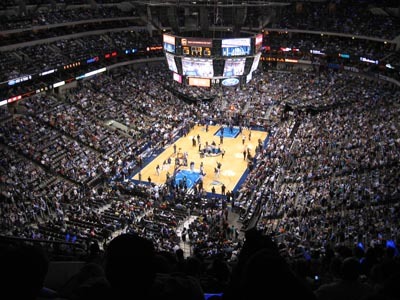 A week and a half ago while on a business trip to the fine city of Dallas, TX, I was able to score some tickets to a Dallas Mavericks v Phoenix Suns game (thanks Stub Hub). 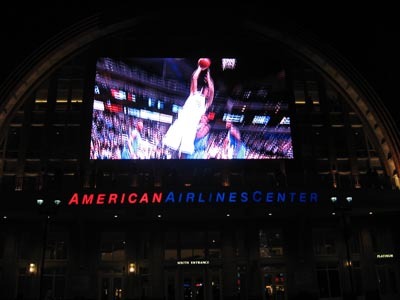 I don’t know if all the games that happen at the American Airlines Center are that good, but for me, it’s 100% accurate so I’m just going to assume all games are similar. 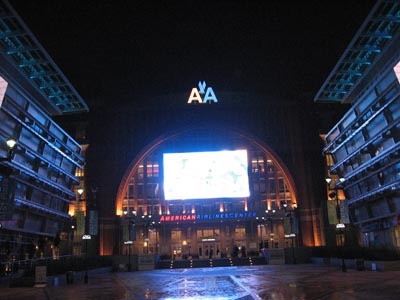 First off, there is the American Airlines Center which is a large television screen covered and wi-fi enabled arena sponsored by Mr. Mark Cuban. I’m not joking about thebeing covered in TVs. 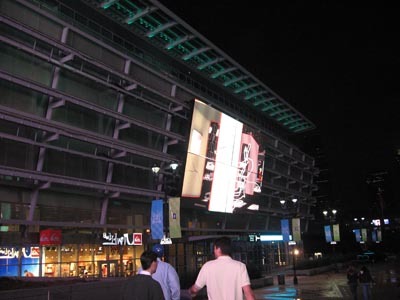 The main entrance has 2 moving screens that flank the big screen above the doors. Oh, and there was another one before you got to those 3. I credit a lot of my interest in sports to a little show called Sports Night, which had nothing to do with sports. Before Aaron Sorkin was lecturing us from Ararat on his wildly successful show The West Wing, he had a half-hour comedy/drama set behind the scenes at a cable network’s evening sports show. Peter “Six Feet Under” Krause and Josh “Dead Poets’ Society and Nothing Really Good Since” Charles played the head writers and broadcasters, Casey McCall and Dan Rydell (as American a pair of names as you could hope to read on TV). Felicity Huffman played the show’s director, and Robert “Benson” Guillaume its executive producer. Sports Night gave me a better look at the haphazard chaos that goes into putting together the glossy melange of CGI transitions that is a cable sports show. Each episode of the fictitious TV show has a certain number of segments. Their currency is minutes, and the writers and producers have to fill those minutes with video segments and commentary. 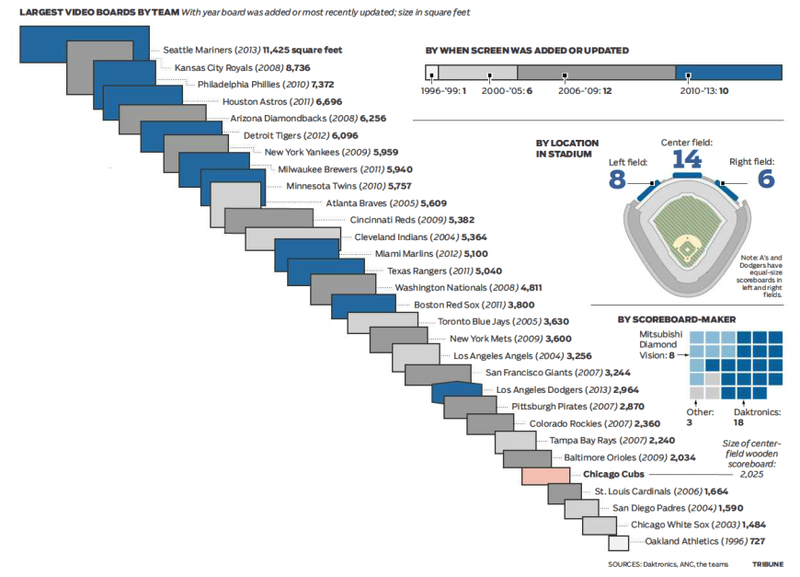 Actual sports content appears pretty rarely in the show. In typical Sorkin fashion, the focus is more on controversial players than interesting games. There’s the football player who roughs up women (“Mary Pat Shelby”), the college players from a Tennessee school who refuse to play under a Confederate flag (“The Six Southern Gentlemen of Tennessee”), or a baseball player who disses his new team’s hometown on the air (“Shane”). It’s heavy on the preachy melodrama, which you wouldn’t think a show about sports would merit. 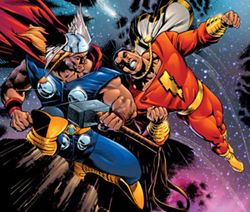 Today I want to tell you about another one of my favorite baseball players: Thor. Now you probably know him by his real name – Eric Byrnes, but I (and my friends) call him Thor. The reason for this name dates back to May 2005 and his time on the Oakland Athletics. I was at Fenway park with a friend or two and we were watching the A’s batting practice. There was one player with blond locks enjoying himself, making some catches, saying hi to the fans, and throwing some of the balls he caught into the stands. I asked around if anyone knew who that was – no one knew, but one answer was “I don’t know, but he looks like Thor.” So Thor was the hero of batting practice. During the game, we got to see Thor made some great catches and have a good night at the plate (1 for 3, 2B, 2BB, 2Runs), Macha was thrown out, and the Sox were up by enough that Fenway emptied out by the eighth allowing me to move right up behind the plate. So from then on I have started to follow Thor.